Do you want to create an exchange opportunity for youth that goes beyond a "tourist" experience? Or maybe you want to bring together diverse groups within your community for a meaningful encounter? The 4-H Cultural Exchange model provides an avenue to fulfill these goals. Having facilitated multiple cross-cultural experiences with young people, I've seen the transformative potential, as well as the big challenges that they can bring. I've learned that it's critical to provide intentional preparation for these experiences so that the young people can dive beyond the surface level - where stereotypes can sometimes be reinforced - and get to the deeper conversations and help them dismantle stereotypes. How do we do that? How great are the cultural differences between the groups? How completely will the individuals be immersed and/or isolated in the culture? How much cross-cultural experience have they had? What is their attitude entering into the experience? To equip people for productive learning experiences, we must take these factors into account. It helps to focus on the thinking and communication skills they will use to navigate differences and build positive relationships with people from different backgrounds. We can help them frame any challenges as richly meaningful learning opportunities. I've worked with colleagues on multiple exchanges to develop a model that meets these goals. We chose lessons from the WeConnect curriculum as the curricular basis for pre-trip gatherings. This way, they arrived at their exchanges with a common set of intercultural skills and concepts. Then, to prepare to host the other delegation, each group selected experiences to represent the culture of their community—from a visit to a maple sugar farm to a tour of a Somali mall. Does this sound like something you would be interested in creating in your community? Joyce Strand and I have developed a Cultural Exchange Planning Guide, which provides guidance, tools, and suggested lesson plans. I’m also happy to serve as a resource to support you in this process. What bridges are you interested in building in your community? How might a cultural exchange help? Wonderful post, Kathryn, with great ideas and practical resources to share! I am hoping we see more of these exchanges occurring around the state. 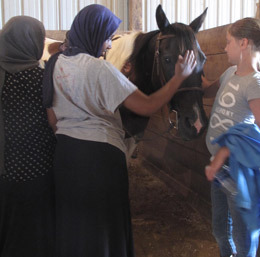 Last year I was within earshot of the event bridging rural Houston County(in southeast MN)and the urban Somali youth exchange and the stories shared were rich! These exchanges feel like tangible progress to building inter-cultural understanding and broadening perspective that can indeed begin to change our world. Let's do more of them! Great post Kathryn! I appreciate how you start out with the fact that these experiences bring about transformative potential (for everyone involved) and challenges. It's making sure we facilitate both effectively so they lend themselves to be positive learning experiences. Youth can then take a next step to a longer, immersion-type experiences! You bring passion and so much expertise to these culturally relevant program models!!! Keep up the good work! Thanks for your thoughts, Josey! I agree that the challenges that arise are as essential to the learning as the positive aspects of the experience. Indeed, those breakdowns are the moments that open us up to the possibility for a breakthrough, but that requires the facilitators to be highly engaged in creating opportunities for reflection rarher than avoiding uncomfortable topics. Reflection is what allows us to turn a tough moment into a learning moment. What insights do you have on the best way to engage in those sometimes sticky situations? Margo, thank you for sharing the feedback you heard about the exchange last summer and for your enthusiasm for this model. Indeed, I see these as opportunities for taking theoretical ideas of creating a more diverse and welcoming program, and transforming them into actual lived experiences. There is simply nothing like developing a friendship with someone and spending some time in their lived reality--we can never go back to feeling disconnected. Our sphere of empathy and mutual responsibility expands. What other types of exchanges could you envision us doing? Thanks, Kathryn. The preparation of both groups is so important--not only for experiences that are intentionally for the purpose of a cultural exchange, but also for those experiences that are more "de facto" cultural exchanges--those trips we sometimes take that expose us to other cultures that we maybe should have anticipated but didn't. You raise a great point, Jessica--the tools we are using in these cultural exchanges can be applied much more broadly as intentional preparation for any type of experience where young people will be encountering differences. As our program and society diversifies, I believe we need to be more mindful of undergoing this kind of preparation for many of our regional, state, and national experiences. Thanks for highlighting this point. Love the resources you are sharing here, Kathryn. I agree that when we don't encourage a deeper exploration of culture during exchanges or trips that push people out of their typical cultural environment, we can reinforce stereotypes. Even the questions that get asked after a trip or an exchange can encourage stereotypes: "What was it like?" or "What were the people like?" Preparation, reflection and curriculum, like the links provided here, help combat the generalization that too often happens after we explore someplace new. Betsy, that is a wise observation that even the questions we ask can influence how young people will experience the exchange. What we bring attention to is what we notice. In Paige's research, he points out that one of the key roles that facilitators can play is helping to frame the experience with a positive attitude since that has such an influence on how they enter into the encounter. Thanks for raising this important point. Cultural immersion can be a powerfully transformative experience! Thanks for your blog post. I agree, Jennifer! Thanks for your deep investment in developing the "WeConnect" curriculum that we are using for preparing youth and adults for these experiences. 6. comprehensive intercultural facilitation throughout the cycle (pre, during, post). I encourage these practices and appreciate your giving an example of how they can be applied in the 4H cultural exchange context.